PLEASE CHECK OUR AVAILABILITY CALENDAR ON OUR WEBSITE (LINK BELOW) BEFORE SUBMITTING AN INQUIRY. INQUIRIES ASKING ABOUT AVAILABILITY WILL NOT BE REPLIED TO. Somerset is our premiere property for multiple couples, large families, bridal parties and corporate retreats in the Shenandoah Valley. Somerset is a custom log home with nearly 5,000 square feet of mountain living. There are four suites, two on the ground floor and two on the second floor, each with a king bed and private bathroom. There is a fifth bedroom in the lower level with a queen bed and futon. A full bathroom serves this level. The great room has a 12 foot dining table perfect for big family meals or meetings. Adjacent to the great room is a large custom kitchen with a bar area, pub table and breakfast nook. The total seating in this area will accommodate 25 people. The full kitchen has a double wall oven, cooktop, refrigerator, microwave, ice maker and dishwasher. The lower level has a theater 100" HDTV DirecTV Blu-Ray Player with unlimited Netflix programming, surround sound and leather seating. In addition, the theater has a pool table and 8 person card table. Somerset is ideal for events such as rehearsal dinners and small receptions. A total of 50 guests can be accommodated. An event guest fee of $5 per person is required for guests not staying overnight. 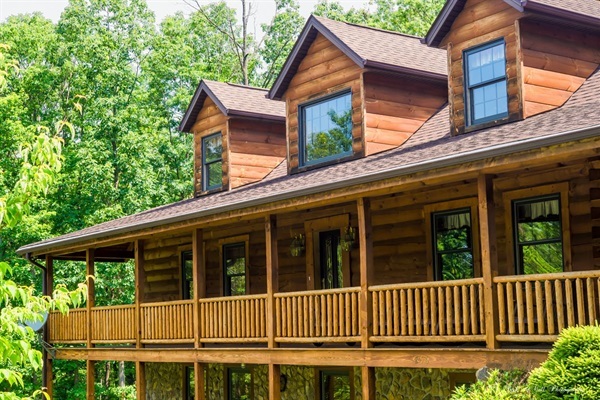 Shenandoah Woods is designed for tranquil vacations, our properties are not for loud groups. We keep our calendar up to date. Please check your desired dates with our calendar before inquiring.